Performs well when importing files, viewing images and updating metadata. It’s possible for MacOS or Linux-based computers to have access to shared files on remote network locations. The Version Control feature is disabled for all shared files. Share folders that contain videos, then import them using network paths, for example: “\\mediaserver\videos\…” using the “Add Files without copying to server” option. This allows you to watch videos without having to download them to a client computer. Install Daminion Server on the same computer as your shared documents. If files are located on a NAS device you can copy your documents to a server computer that has Daminion Server installed. Press the “Add” button and enter your server PC name or IP address, or simply type in “localhost” (without quotes). You can get the server IP address from the Daminion Server Administration dashboard. Select the local folders that contain the documents on the Server PC (you can select multiple folders) and press the “Add” button. The Daminion Import window will appear. Select the “Add Files to catalog without copying” option to import files from this computer. Click on the “Import” button to add the selected files to Daminion Server. This takes some time, but you can start working with Daminion Client while the files are being imported because the import process runs in the background. When the import is complete all your documents, with their descriptions, will be visible to other Daminion Clients connected to the Daminion Server. Any Daminion Client connected to your local network can add new files to the Daminion Server. 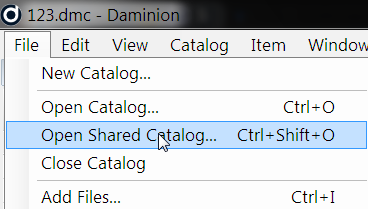 Launch a Daminion Client, open a shared catalog and click on the “Add Files” button. Select the files you want to import. These files can be from a flash card or a local folder. Check the “Copy files to a shared folder…” option. Specify your network destination folder in the panel on the right. Now all files from the local computer will be copied to shared folders on the server computer and added to Daminion Server. In the Daminion Server Administration Panel, you can specify a server-based folder where the uploaded files will be stored. 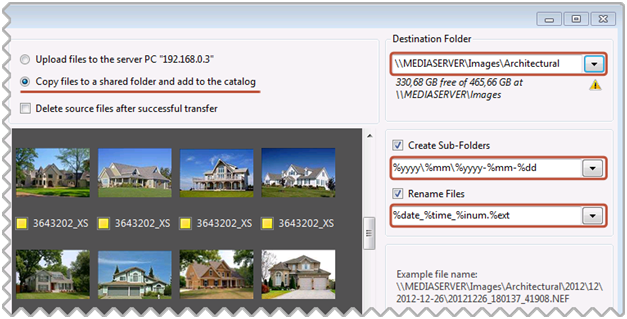 Share folders that contain large video files and then import them using network paths, for example: “\\mediaserver\videos\…” and the “Add Files without copying to server” option. This allows you to watch videos without having to download them to a client computer. To achieve the best performance, we recommend that you install Daminion Server on a computer with a minimum of 4 GB RAM, an Intel Core Duo processor or higher, and a separate hard disk with plenty of free space. Click on the “Import” button to add the selected files to Daminion Server. This takes some time, but because the importing process runs in the background, you can start working with Daminion Client while the files are being imported. Launch Daminion Client and click on the “Add Files” button. Select the files you want to import. These can be files from a flash card or a local folder. 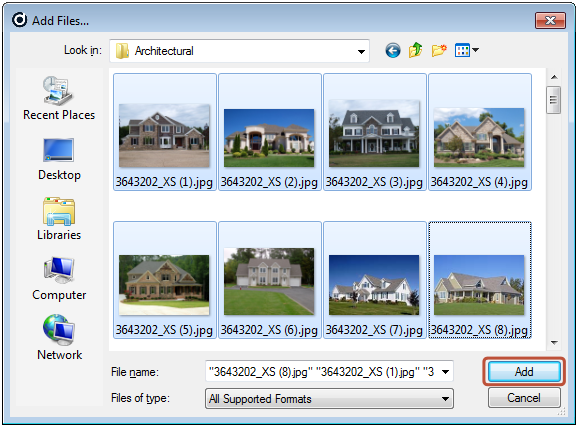 In the right hand panel, you can optionally specify a sub-folder and file naming templates for the imported files. All the chosen files from the local computer will be uploaded to the Daminion Server. In the Daminion Server Administration Panel, you can specify which server-based folder the uploaded files will be stored in. This is the most common setup, but not necessarily the best. Quick Start: you can start using Daminion quickly, without breaking your existing workflow. You simply need to specify where you’d like your image library to be located on Daminion Server, and then press the “Add” button. Slow. The speed at which you can import files, update metadata, and preview images is highly dependent on the network bandwidth between the Server PC and the computer on which the Documents are located. Insecure. There is a risk that files accessible from outside the Daminion Server Control Panel could be “screwed-up” when using Windows Explorer or any other file explorer. No Version Control. The Version Control feature is disabled for all shared files. This is to prevent them from being accessed from outside the Daminion Server control, and to avoid damaging the Version Control mechanism. Install Daminion Server on a computer with a minimum of 4 GB RAM, an Intel Core Duo processor or higher, a separate hard disk with plenty of free space. Add Daminion Server database to your existing backup schedule. Learn more about how to backup your Daminion Server database or add it to your existing backup tool’s scheduler. Press the “Add” button and enter your server PC’s name or IP address. You can get this info from the Dashboard on the Daminion Server Administration Panel on your server PC. Now locate and select the remote shared folders that contain the documents you want to import (you can select multiple folders) and click the “Add” button. Daminion’s Import window will appear. Select the “Add Files to the catalog without copying” option and press the Import button. Only links to the selected documents will be added to the Daminion Server, without copying the actual files to the server PC. The import process will take some time, but it works in the background so you can start working with Daminion Client immediately. Once the import is complete your documents and their descriptions will be visible to other Daminion Clients connected to the Daminion Server. 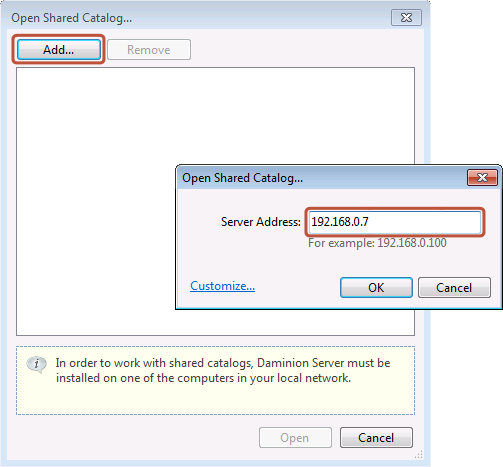 Launch Daminion Client and open your shared catalog. Click on the “Add Files” button and select files you want to import to the opened catalog. In the panel on the right, specify a storage destination for the imported files. You can also specify file/sub-folder naming rules. Use Windows Explorer or any other file manager to copy new files to the shared network folder where all your documents are stored. You can also import newly added files to already imported folders with the “Rescan Folders…” option. 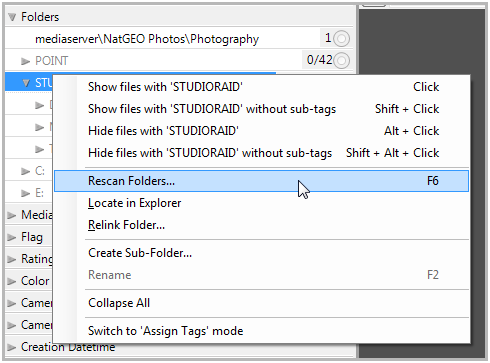 To do this, right click on the root folder and navigate to the “Rescan Folders…” option on the context menu.